Home / Changing Perceptions / Abby’s Reflections #36 | What’s In A Name? 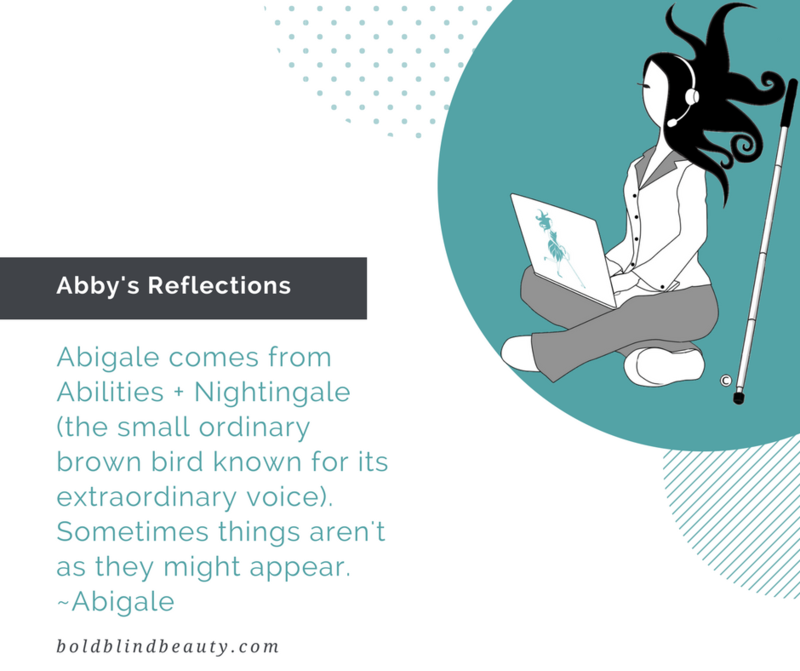 Abby’s Reflections #36 | What’s In A Name? Changing perceptions is a massive undertaking but I believe anything is possible. If we could throw out everything we THINK we KNOW about a GROUP of people, allow ourselves to be accepting, and place our focus on INDIVIDUALS it brings us closer to inclusivity. Description: A white, teal, and gray Bold Blind Beauty template utilizing the ‘Abby’s Corner’ image of Abby sitting cross-legged in her PJs (gray bottoms & white top with a gray collar) with a teal Abby logo laptop on her lap. Sporting her signature explosive hairstyle, she is wearing a headset with microphone and her white cane is propped up next to her. Fear of the unknown is our enemy. Being open to new ways of thinking and ‘seeing’ is crucial I feel. Good thoughts. I look for your words regularly. P.S., I’m getting some explosive hair. Or maybe I’ll just draw myself that way. Very nice, very creative. This says it all about our community – finding a voice in a sighted world that may not always hear our voice and see the whole person we are beyond our visible disability.